Boston's Capitol undergoes a "facelift"
It's a crisp, sunlit morning in Boston, one of those picture perfect days you hope for when exploring a new city - especially one with so much history. Boston is one of my favorite cities and although I've been many times, it never ceases to draw me into its spell. There's a certain energy here that's almost palpable, and while it was obviously so different 300 years ago, you can almost sense the patriots who once called it home. This is the "Cradle of Liberty," the birthplace of American Independence and I'm anxious to explore the Freedom Trail, where so many important events took place. Started in the 1950s by concerned Bostonians who wanted to preserve the story of the American Revolution, the 2.5 mile trail is marked by a bricked or painted red line winding past 16 historically significant sites. Beginning at Boston Common and ending in Charlestown at the USS Constitution, it is an integral part of Boston, attracting more than 3.2 million visitors annually. I opt for the personal touch. "Hi, my name is Michael," our guide announces to our small group. "Would you like me to slip into character or shall I stick with modern-day talk?" We all agree that we want the "real" deal. "In that case, my name is George Wright," he says, slipping into a full British brogue. "I was born here on Nov. 18, 1745 and I'm a cabinetmaker. We're standing on Beacon Hill and if you look over there, that was the site of the first gallows. As you can see, it's now part of a kids' playground. Bet you didn't except that, did you?" "George" appears to be a comedian. "Our tour begins at the State Capitol and ends across the river in Charlestown, but I'll be with you only for the first mile of this journey. After that, you're on your own to explore the rest of the city," he informs us. After wrestling to adjust his waistcoat and suspenders, George leads us to the State Capitol, stopping in front of the Robert Gould Shaw monument, located across from it. The intricately carved bronze relief is dedicated to the 54th Regimen of the Civil War. "Look closely at the details on the soldiers' faces," he instructs. "What do you see? Look at the woman flying above them. Do you see the angel of death, or is she protecting them?" We look across to the "new" State House -completed in 1798. 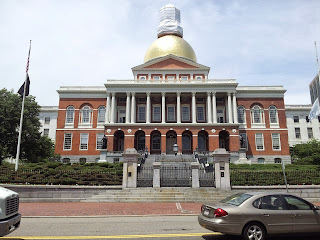 "This was designed by Charles Bulfinch and the golden dome was once made of wood and later overlaid with copper by Paul Revere," George relates. Passing by Park Street Church we find a crowd of tourists listening in rapt attention to their guide, as he regales them with stories about "Brimstone Corner," as it was known because of the gunpowder that was stored in the crypt during the War of 1812. 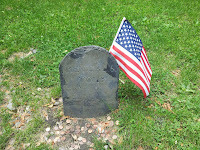 Our next stop, Granary Burying Ground - the third oldest burying ground in Boston - is the final resting place of Paul Revere, Benjamin Franklin's parents (Ben is buried in Philadelphia, where he lived most of his adult life), John Hancock and "Mother Goose." George spends quite a bit of time here, giving you a sense that it's a favorite site. "There are only 2,300 markers, but it's thought that more than 5,000 people are underground," he informs us. To save space, some were buried standing up and nobody's really buried where their markers say they are. If you notice, they're all in neat rows." 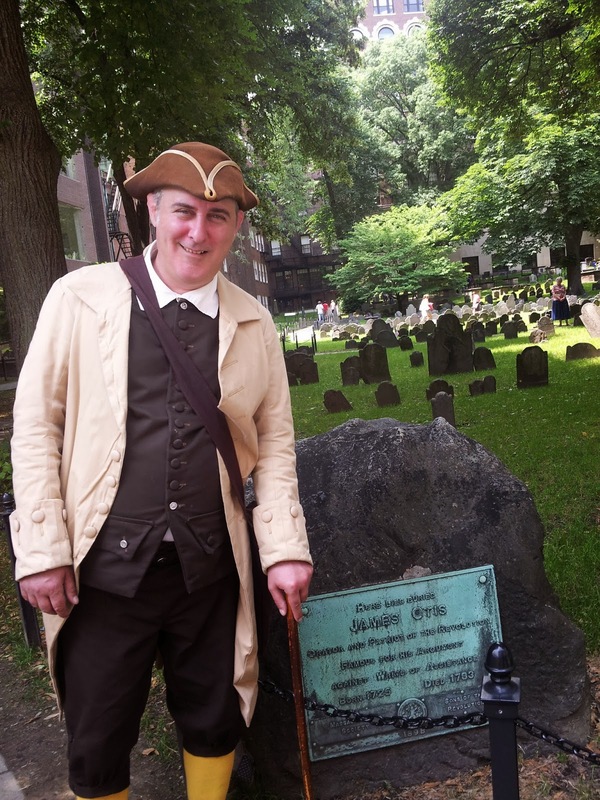 He tosses out more anecdotes before ushering us past King's Chapel and Burying Ground (the city's oldest), stopping at Ben Franklin's statue and Boston Latin School (the oldest public school in the US). Across the street, the Omni Parker House Hotel has operated as a hotel since 1855 and was the birthplace of Boston cream pie, according to George. "John Wilkes Booth was a guest here and they say that he was seen target practicing down that alley alongside it, just days before he went to Washington D.C." he tells us, adding: "We all know what happened when he got there." 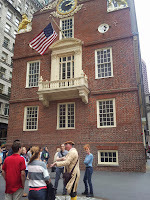 We continue towards Fanueil Hall, site of America's first Town Meeting, stopping for a solemn moment in front of Old State House, site of the Boston Massacre in which British soldiers killed five civilians in 1770 and injured six others. "What happened here was an accident. The soldiers fired on the crowd without orders to do so," George tells us. Erected in 1713, this was the Capitol of the colony and is the oldest public building still standing in the eastern US. "The Declaration of Independence was read from that balcony," says George says. George bids us farewell at our next stop. "This is where I get off. If you walk for 10 minutes in that direction, you'll arrive at Paul Revere's House," he says pointing northeast. He tosses out a few more anecdotes before tapping his three-corner hat and heading off. Given to Boston in 1742 by Peter Faneuil "the topmost merchant in all the town," Fanueil Hall is topped off by a weathervane with a copper and gold leaf grasshopper, crafted by Sherm Drowne. According to legend, during the War of 1812, it was used to screen spies. "Anyone who claims to be a Bostonian and who does not know the shape of Fanueil Hall's weathervane must be an impostor" - or so they thought. 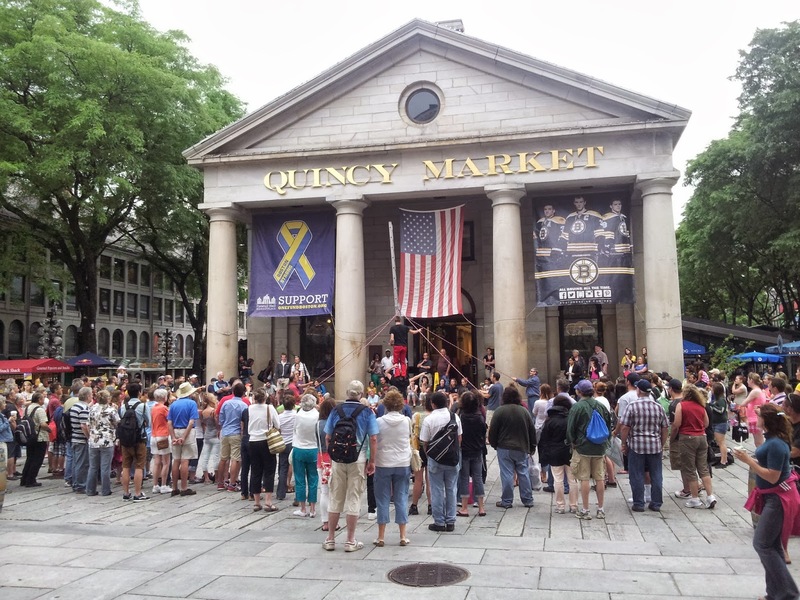 Today, the venerable hall - and the surrounding complex known as Quincy Market - is a marketplace teeming with vendors and restaurants. It is the largest food hall in New England. I still have a mile-and-a-half of Freedom Trail to walk so I stop to fortify myself with a mouth-watering lobster roll before heading off in the direction of Paul Revere's House, Old North Church, Copp's Burying Ground, the USS Constitution ("Old Ironsides") and the Bunker Hill Monument. Somehow, I sense that it just won't be the same without "George Wright" leading the way. 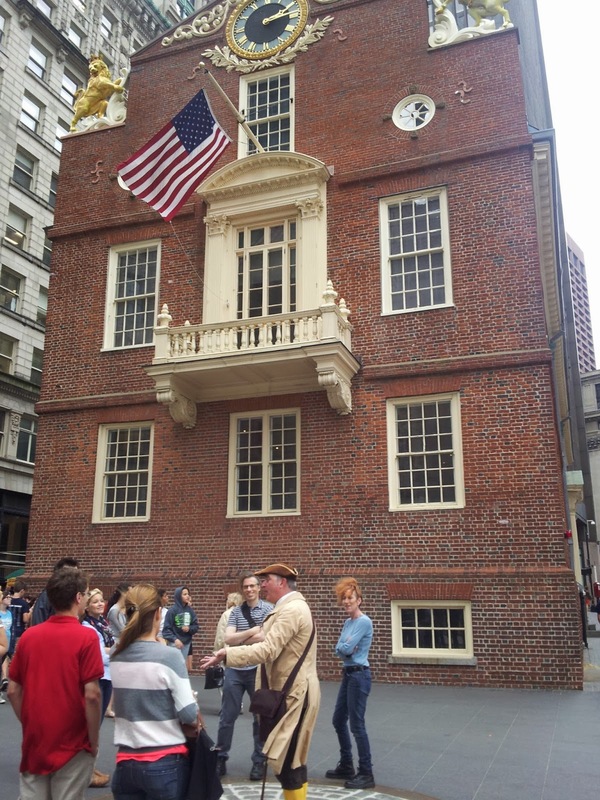 The Freedom Trail Foundation offers guided tours daily throughout the year. There are 12 daily tours April - Nov. and a reduced schedule Dec. - March. Tickets are valid for any day, for any tour time and may be purchased online or at the departure location. Tours are limited to 10 people. Tours leave every hour on the hour (beginning 11:00 a.m.) from Boston Common Visitor Information Center and every hour on the half-hour beginning 10:30 a.m.) from Arts Boston BosTix booth at Faneuil Hall. Tours are $12 for adults, $8 children 6 - 12. Available on all platforms, the new Freedom Trail® mobile app features 16 official historic sites of Boston’s Freedom Trail. The app is offered on iTunes for $4.95. The recently introduced three-and-a-half hour MP3 audio guide can be purchased for $17. A lobster roll and a walk through the history of Freedom Trail sounds like a perfect Boston day. You've convinced me I'm overdue for a trip to that fascinating city. Last time I was there was in the middle of a snowstorm so my sightseeing was limited. It truly is a fabulous city and one of my favorites. Indeed, go now....before the snow starts to fly! I've yet to visit Boston and your post makes me realize what I've missed. We used to shun "organized" tours but have grown to enjoy them because of the anecdotes and various history snippets that we miss when reading a guidebook. I love wandering around old graveyards (a bit macabre but so interesting...) and thought that your comment about 5000 possible graves with only 2300 markers was very intriguing... there's a good story there! Don't hesistate....go now! Boston is such a wonderful city and I live so close that I should go more often. You are so right about those graves! I wouldn't know where to begin. We love Boston precisely because of its walk ability, particularly the north end. The Freedom Trail is perfect to get acclimated and brush up in your history. It truly is a wonderful experience. So much happened there that you feel that you can almost "touch" those people from the past. You've highlighted one of the favorite 'attractions' in my home town of Boston. I'm so glad you enjoyed it and when you're here next time, make sure to connect for a cup of coffee! I'd love to do that! I don't get there as often as I'd like to, but I hope to rectify that. I'll let you know. It's such an easy city to navigate on foot. Not so much fun in a car! It's one of my favorites - and to easy to get around...on foot! Boston is such a fun city and Quincy Market has something for everyone. It does, indeed.....especially a variety of delicious food!